The Centre for the Analysis of Genome Evolution and Function (CAGEF) is an extra-departmental unit established through the University of Toronto’s Academic Initiative Fund in 2006 and maintained via generous continuing support from the Faculty of Arts & Science. CAGEF’s mission is to promote interdisciplinary research in comparative, evolutionary, and functional analyses of genomes and proteomes, and to promote training and education in genome biology through the development and support of innovative teaching initiatives, courses, and workshops. 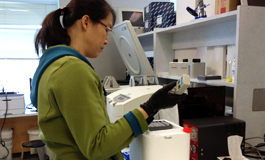 CAGEF provides genomics, proteomics, and bioinformatic services, including Illumina-based genome, microbiome, and metagenome sequencing and transcriptome analysis, and proteome and protein modification analysis via LC-MS/MS. CAGEF has established internationally-recognized genomics expertise in the analysis of non-standard species, systems, and environments, with particular experience in microbial, plant, and environmental genomics and metagenomics. Our facility is located in the heart of downtown Toronto, on the University of Toronto’s St. George Campus. Map of physical interactions between extracellular domains of Arabidopsis leucine-rich repeat receptor kinases.